This guy in the above video was able to turn an average bike ride into an insanely trippy and well done video! The big man on a small planet look is incredibly well done and gives it a Super Mario Galaxy feel. So how did he do it and how can you make a cool trippy video of your own? Initially I thought J0n4s was using nothing more than a mounted camera with a fisheye lens, but what he actually did was far more complicated than that. On his blog, J0n4s shows us he used six GoPro cameras for this video. For those not aware of the cost of these brilliant little cameras, that’s at minimum a thousand dollar investment. 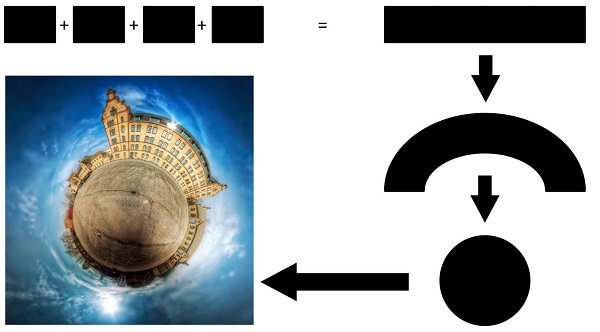 In the diagram that is found below, J0n4s shows us that the cameras can be turned on their own axis to create what is called a “spherical panorama” or “that effect that creates the ‘tiny planet’ photos”. To a lesser degree, you can technically achieve this effect using the panorama shot on your iPhone! It won’t look nearly as cool, but it can be done. From there J0n4s used a custom 3D printed stand he made with the help of friends. The base had to be designed so that the fisheye lens footage from each camera would pick up right at the cut off point of the camera on any given side of it. The amount of precision and work that went into creating such a device is well appreciated considering its use was just for one video. J0n4s sees companies such as Google utilizing his base for future street view projects, or better yet making use of it in giving in depth virtual tours of buildings. If you took away the fisheye lens, I could see how this design would give you an even more detailed view than what you already see with Google street view. For anyone hoping to emulate J0n4s who has the money to drop on the 6 GoPro cameras it took to make it, the 3D printed blueprint for his base is free to download right here. Now go out there, buy those cameras, and make the Super Mario Galaxy fan film I so desperately want!